The Athletic Department is pleased to announce that Sophomore Lauren Roetgerman (SO – Minster H.S.) has received the Buckeye Charters Student-Athlete of Distinction Award for the month of September. Each month the Athletic Department in conjunction with Buckeye Charters, selects a student-athlete that has been a leader in all three categories – Community Service, Classroom and Competition – also known as the 3 C’s. This month we honor Sophomore Lauren Roetgerman of the Volleyball team. Lauren has been active with the team this fall in the community and continues to lead the way in the Classroom. 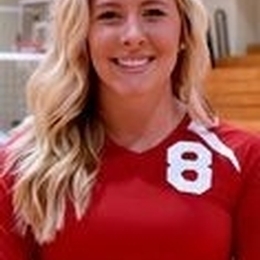 Lauren was Academic All-Conference and earned NJCAA All-Academic honors last season and was a member of the 2015-16 Sinclair Volleyball team that earned a prestigious team honor of NJCAA All-Academic Team for an overall team GPA of over 3.0 for the year. The Sophomore captain has also been a leader on the court helping the Pride to a great start with a 17- 5 overall record and a 7-1 conference mark, landing the Pride in 2nd place heading into the final month of the season.